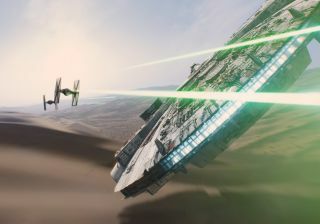 The legendary space ship, the Millennium Falcon, appears in the newest trailer for the upcoming movie "Star Wars: The Force Awakens." It's a good time to be a science fiction fan: In the past week, a storm of new sci-fi movie trailers has hit the web, featuring everything from iconic spaceships to parallel universes to real life rockets. Three trailers that caught the attention of space fans were the second teaser trailer for "Star Wars: The Force Awakens," the first full-length trailer for "The Fantastic Four" reboot, and the first teaser trailer for "Batman v Superman: Dawn of Justice." And even though it wasn't space-related, it was hard not to get excited about the new trailer for "Jurassic World." Last Thursday (April 16), Disney and Lucasfilms released the second teaser trailer for the newest movie in the Star Wars franchise. "Star Wars: The Force Awakens," is directly by J.J. Abrams, and while this teaser trailer doesn't reveal much about the movie's plot, it suggests that the new film is closely linked to the original trilogy. On Friday, the first teaser trailer for the movie "Batman v Superman: Dawn of Justice," appeared online, and features an awesome treat for space fans: Neil deGrasse Tyson is one of a handful of voices delivering narration in the first part of the trailer (it's not the first time Superman and Tyson have crossed paths). In addition, there's a shot of Superman holding up some kind of space capsule or rocket. The movie picks up in the universe established in the 2013 Superman movie "Man of Steel." Henry Cavill will return as Superman, Amy Adams will return as Lois Lane, Ben Affleck will star as Batman, and Zack Snyder will direct. The movie is due out on March 25, 2016. On Sunday, the first full-length trailer for the new "Fantastic Four" movie gave viewers a better look at the "interdimensional" worlds where the title characters gain their superpowers. The movie is independent of the previous "Fantastic Four" movies, and is being directed by Josh Trank ("Chronicle"). Miles Teller stars as Reed Richards/Mr. Fantastic, Michael B. Jordan as Johnny Storm/The Human Torch, Kate Mara as Sue Storm/The Invisible Woman and Jamie Bell as Ben Grimm/Thing. The movie's scheduled release date is August 7. And last but not least, a full-length trailer for the upcoming movie "Jurassic World," was released on Monday, and provides a bit more insight into the plot: the island established in the first three "Jurassic Park" movies has been turned into a tourist attraction, but things go horribly wrong when a genetically modified dinosaur gets loose. Once again, there's nothing space-related about this movie, and it might be light on the science, but the dinosaurs are still pretty exciting for sci-fi fans. The movie is due out on June 12. What science movies are you excited to see in 2015 and 2016?